2000 Hurco mdl. Hawk 40/DSM 4-Axis CNC Vertical Mill s/n B40-1068 w/ Hurco Ultimax Controls, 3950 Max RPM, Power Draw Bar, CAT-40Taper Spindle, 13” x 58” Table, coolant. 2000 Hurco mdl. Hawk 40/DSM CNC Vertical Mill s/n B40-1064 w/ Hurco Ultimax Controls, 3950 Max RPM, Power Draw Bar, CAT-40Taper Spindle, 13” x 58” Table, Coolant. Bridgeport / EZ Trak CNC Vertical Mill s/n 282674E w/ Upgraded EZ-Trak/EMI Controls, 2Hp Motor, 60-4200 RPM, Chrome Ways, Power Draw Bar, Power Knee Feed, 9” x 48” Table. 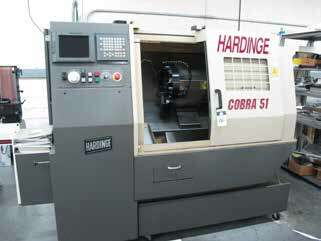 Hardinge “Cobra 51” CNC Turning Center s/n C51-241 w/ Fanuc 21i-TA Controls, 12-Station Turret, Parts Catcher, 8” 3-Jaw Power Chuck, 20C Collet Closer, 3495 Metered Hours. Monarch 10” x 20” Lathe s/n 38925-R w/ Acu-Rite DRO, 25-4000 RPM, Inch Threading, Metric Change Gears, Taper Attachment, Tailstock, 5C Collet Closer, 8” 6-Jaw Chuck, 8” 3-Jaw Chuck, 8” 4-Jaw Chuck, 6” 3-Jaw Chuck, 6” 4-Jaw Chuck, Aloris Tool Post, Monarch Tooling Cabinet. 2009 Grizzly mdl. G4000 12” x 24” Bench Model Lathe s/n 901075 w/ 120-2000 RPM, Inch/mm Threading, Tailstock, Steady and Follow Rests, 5C Collet Closer, 4” 3-Jaaw Chuck, Tool Post, stand. National mdl. NH5212 12GA x 52” Power Shear s/n 214-0700 w/ Back Gage, Front Supports. Rotex mdl. 18A2-OW/S 18-Station Rotary Turret Punch/Shear s/n 51023 w/ 5/32” to 1 3⁄4” Punches. Dake 45-Ton Cap Sliding Ram Electric-Hydraulic H-Frame Press s/n 200254. Pexto mdl. PX24 16GA x 24” Finger Brake s/n 7-00 w/ Stand. Weldsale 30” x 60” Acorn Style Layout Forming Table w/ Hold Downs and Locating Accessories. Thermal Dynamics PAK Master 75XL Plasma Cutting System s/n C92280AI915011. Thermal Arc 300GTSW AC/DC Inverter Arc Welder s/n Y02625A18888099G w/ ProCool II Cooler and Cart. Lincoln Power MIG 225 MIG Welding Power Source s/n U1990830766 w/ Prince XL Spool Gun. Darex mdl. Sp2500 Ultra Precision Drill Sharpener. Accu-Finish Series II Carbide Tool Lapping Machine w/ Stand and Acces. Baldor 1.5Hp 12” Pedestal Grinde. Delta 6” Belt / 12” Disc Sander w/ Stand. Cyclone Dry Blast Cabinet w/ Dust Collector. Eastwood 18Lb Vibratory Media Tumbler. 2000 Clausing “Startrite” mdl. V900H 36” Vertical Band Saw s/n 202656 w/ Blade Welder, 50-5200 Dial FPM Kalamazoo mdl. H9AW 9” Horizontal Band Saw s/n K21900. Everett 12” Abrasive Cutoff Saw w/ Stand. Clausing 20 mdl. 2274 Pedestal Drill Press s/n20-532857. Delta mdl. 17-965 16-Speed Pedestal Drill Press. 2011 Ingersoll Rand mdl. T30 10Hp Horizontal Air Compressor s/n 30TC906777 w/ 120 Gallon Tank. 2004 Ingersoll Rand mdl. DS35 Refrigerated Air Dryer s/n 2766810001. 1999 Kitagawa Technara 4th(65)CAT-40 Balanced Taper Tooling (to 25,000 RPM). Roll-A-Way Tool Boxes and Taper Tooling Racks. Axis 8” 3-Jaw Rotary Head w/ Mill Center. Yuasa 8” 3-Jaw Rotary Chuck. Suburban 6” x 12” Sine Table. Suburban 6” x 6” Compound Sine Table. Starrett 5” Bench Vise w/ Bench. Dake No. 1 1⁄2 Arbor Press. Parallel Sets, Angle Blocks, 1–3 Blocks. Power and Hand Tools.Abrasives and Shop Supplies. Starrett 24” x 36” x 8” Crystal Pink Granite Surface Plate w/ Roller Base. Starrett 0-12” OD Mic Set. (2)Meyer Pin Gage Cabinets .751”-1.000”, .011”-.750”. Bausch & Lomb Microscope w/ Light Source. 2001 Multiton mdl. SM20-130 2000 Lb Cap Electric Pallet Mover s/n 08130950101. Arcan 4000 Lb Cap Hydraulic Engine Hoist. 500 Lb Cap Hydraulic Die Cart.